The story of Aeneas and the Golden Bough is found in the Aeneid, the epic by the Roman poet Virgil. According to this tale, the spirit of Anchises, Aeneas's dead father, appears and tells Aeneas to visit the underworld, where he will learn what the future holds in store for people. First, however, Aeneas must find the oracle known as the Sibyl of Cumae, who will lead him to the land of the dead. This painting by J.M.W. 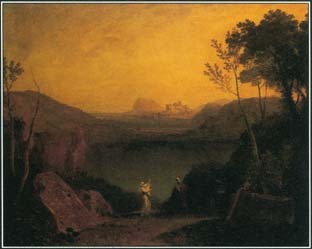 Turner illustrates a story from Roman mythology. The Sibyl of Cumae explains to Aeneas that he must obtain a sacred branch called the Golden Bough for safe passage through the underworld. golden leaves. Aeneas gets the Golden Bough and returns to the Sibyl of Cumae. Together Aeneas and the Sibyl enter the underworld. With the Golden Bough in his possession, the hero is able to pass safely through the various dangers and obstacles there. At the deadly and magical river Acheron, the boatman Charon sees the sacred bough and takes Aeneas and the Sibyl across the water to the kingdom of Hades*. There Aeneas finds the spirit of his father. The Golden Bough also appears in other legends, particularly in connection with the goddess Diana. According to some accounts, it was a custom in the cult of Diana for a slave to cut a branch from a sacred tree and then kill the priest responsible for guarding the tree. The slave took the priest's place and was later killed himself in the same way. This custom inspired The Golden Bough, a multivolume study of religion and mythology written by Scottish scholar Sir James Frazer and published in 1890. See also Aeneas ; Aeneid, the ; Diana ; Persephone ; Roman Mythology ; Sibyls, the ; Trees in Mythology ; Underworld .